On the 13th November 2014, William and Kate attended the Royal Variety Performance at the Palladium Theatre in London. This is the first time the couple attended the performance representing The Queen. The Royal Variety Performance benefits the Entertainment Artistes Benevolent Fund (EBAF), of which The Queen is Patron. William and Kate watched a number of entertaining acts, including Dame Shirley Bassey, Ed Sheeran, Demi Lovato and Bette Midler. 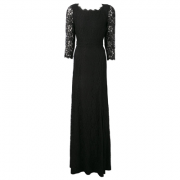 Tonight Kate looked wonderful in a black lace dress by Diane Von Furstenberg. The style name is ‘Zarita‘. 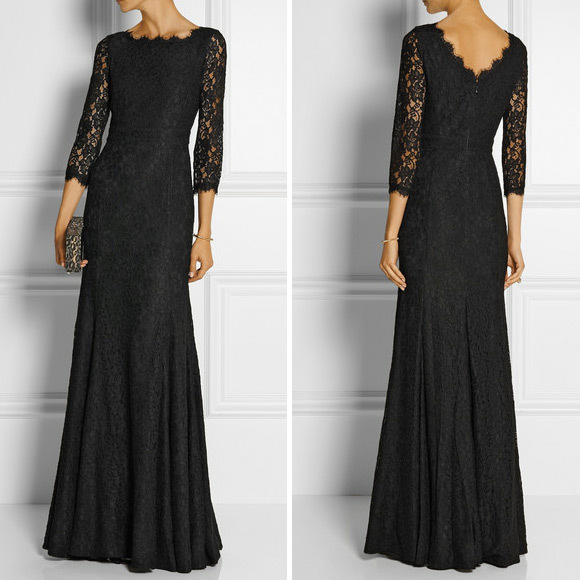 The Zarita is a floor-length lace gown with a fitted bodice and waist, which opens into a sweeping fluted hem. 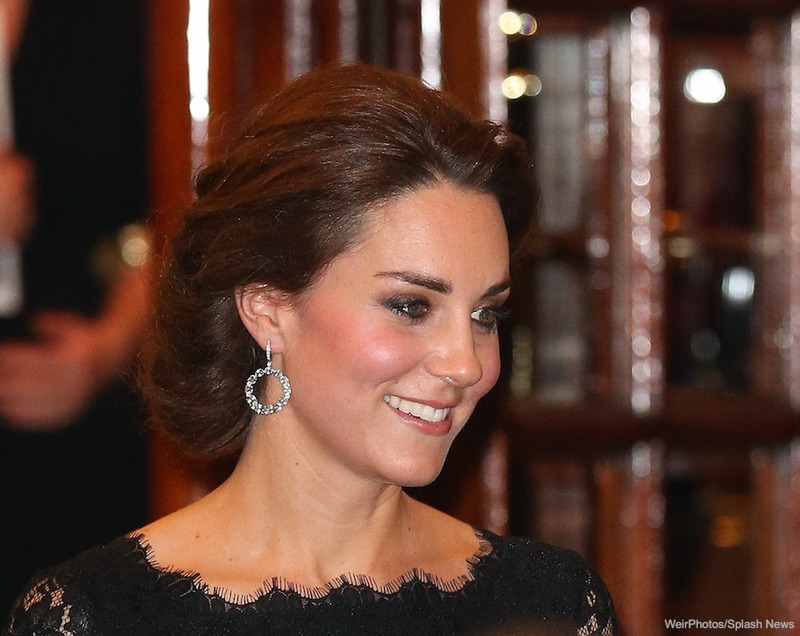 You might have noticed Kate’s sparkling earrings, they’re dazzling! They’re the Kiki McDonough Lola style. 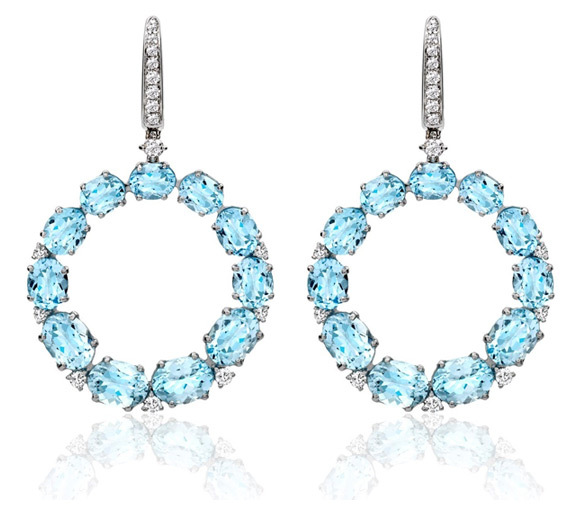 The £3,200 earrings are made with blue topaz, 18ct white gold and diamonds. Kate carried her black beaded clutch bag (shown here at the Action of Addiction Autumn Gala Evening in October 2014). The back features a black fan design made from sequins and beads. The bag is a vintage piece by “Magid“. Anna from My Small Obsessions has researched the bag and believes it could date from the 1950s. Finally, Kate wore her Jimmy Choo Cosmic pumps in black suede. (Pictured below on another occasion). The black suede shoes feature a thick platform and an almond shape toe. They retailed for £450 / $695. Sadly, Jimmy Choo have discontinued the ‘Cosmic’ pumps, but you can shop the similar ‘Hope’ style here. Alternatively, check out the various colours available on eBay.